This Pinkerton Paper sings my song! Words like dignity, agency, organizing, self-worth, stability, respect are music to my ears. When workforce development can build pathways to this we do much more than create one job placement at a time. We contribute to the work of building a more just society, rooted in self-actualization and empowerment. Dawson advises that workforce development “practitioners and their funders must develop new expertise, new relationships and new resources, and perhaps even new organizations.” I argue that the “new” he refers to is really modeled after the old. Union organizing and workers’ victories show this. Worker well-being and stability are inherent elements in union contracts. Much more than fair wages are negotiated in contracts. These contracts guarantee worker engagement through representation, establish mechanisms to manage fair distribution of hours, shifts, assignments, promotions and grievance procedures. Through these same contracts, management agrees to a shared approach for training for new and incumbent workers. (Albeit less now than in the past.) Historically, it is unions who championed (both on the job and in legislation) the standards for good health and safety practices. Pensions, access to health care, clear wage standards, are all agreed to and signed for in union contracts. 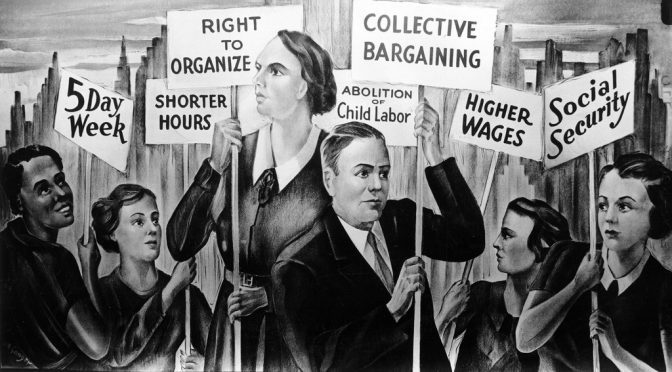 The union movement historically created stability for a huge swath of the working class. Maybe what is old is new again. With the precipitous decline in unionization and yet a growing awareness of or reference to “good jobs”, (call them high road, social entrepreneurship, a triple bottom line company, or even best yet, worker-owned cooperatives), we need to reference the lessons learned from a global labor movement as we collaborate with industry to develop their workforce. Dawson sparks this thinking. The labor movement, the worker centers of today, Black Lives Matter, the Fight for 15 and all the justice based work that surrounds us are part of a movement for shared prosperity, community wealth and human empowerment. Our work in workforce development could and should include teaching this and making sure that every worker who goes to work understands how they hold the power to organize for and participate in a better life. We talk about teaching soft skills and hard skills as if being punctual and knowing the tools of your trade will get you a better job. This does not take into account structural inequalities that made the one percent rich and the rest of us at their service. We need old-fashioned organizing for rights and control now more than ever. It is neoliberalism that built the strong opposition to the labor movement and that makes it seem so irrelevant now. It is not taught in most workforce development programs because we obsess with satisfying the other customer. Industry matters, yes. But just and fair industry practices matter more. Acquiescing to the “the bottom line” as if profit for the company was all that was will not tilt the scale to better work. This is what workforce development practitioners and funders need to take back. The labor movement figured this out years ago when they contractually created labor-management training funds. They understood that incumbent worker training was a partnership with industry and that workers’ representatives needed to assure that the partnership was in place and that workers were respected for all the aspects that make their jobs good. We are at a new era. Union representation of workers is on the precipitous decline. But a clamoring for high road employment is on the rise. Whether with organizing skills or cooperative business skills, let’s make sure that workers coming through our programs understand the ways to make bad jobs better.